Autumn is really starting to happen here (finally), which means I really need to get those 150 daffodil bulbs into the ground this weekend in between a curriculum planning meeting, a gig in the big smoke and a sleep-over at the in-laws. 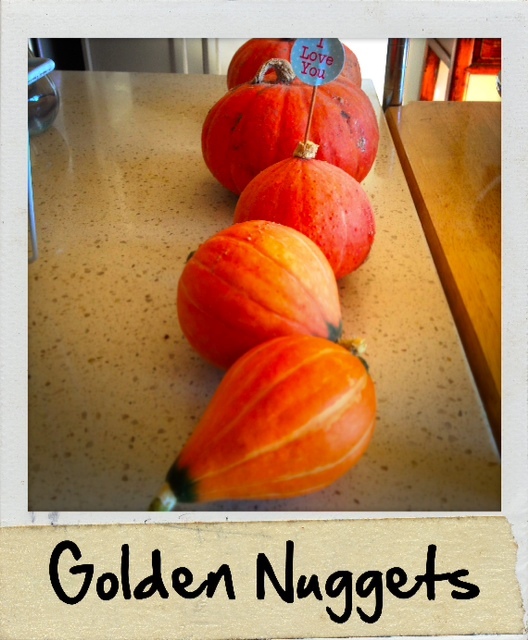 Pumpkins are done for, the plant has completely died off so I picked my last couple of runty little golden nuggets. Those suspiciously chilli looking capsicums might still actually be capsicums, according to a friend. That’s good news. Otherwise out of my epic capsicum trials I would have gotten 2 capsicum. I am completely counting my chickens before they are hatched with that one. There are 2 on the plants. If that will turn red or get any bigger is a completely different thing. I got my free autumn seeds from Digger’s about a month ago and they are yet to go in the ground. I should get on to that. I’m just not excited by the idea of savoy cabbage, more parsley, raab broccoli and bloomsdale spinach. That’s unfair of me. Come the middle of winter I am sure I will be so excited about all that green stuff. Right now I am mourning the end of my amazing tomato season. This song has such great lyrics and here is has some really fantastic instrumental stuff going on. Herbie Hancock is a legendary pianist. I much prefer Kate Bush to Pink for the female voice, but you can’t have everything. Peter Gabriel and John Legend have somewhat similar voices (oooh, blasphemy I hear some of you say). I guess, in my allstar version it would pretty much be the Peter Gabriel/Kate Bush version with Herbie Hancock on piano. 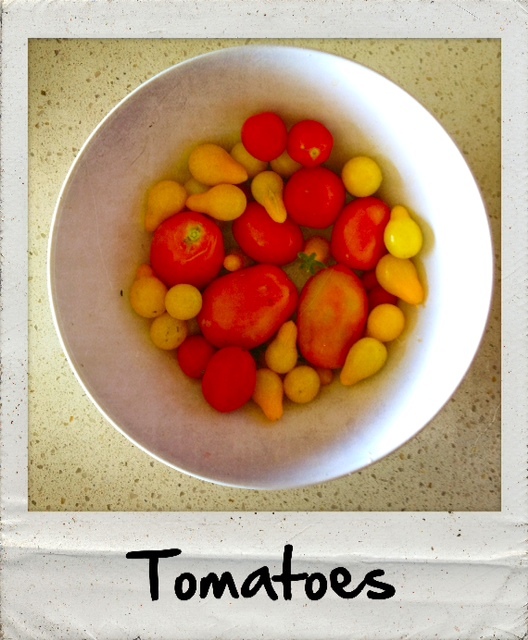 Gosh, I’m starting to put lovely little tomatoes in everything lately. Every day I go out and pick some. The mini yellow pear are by far the largest producers. I think the mini romas are coming to an end and FINALLY, my two potted tomatoes are producing. 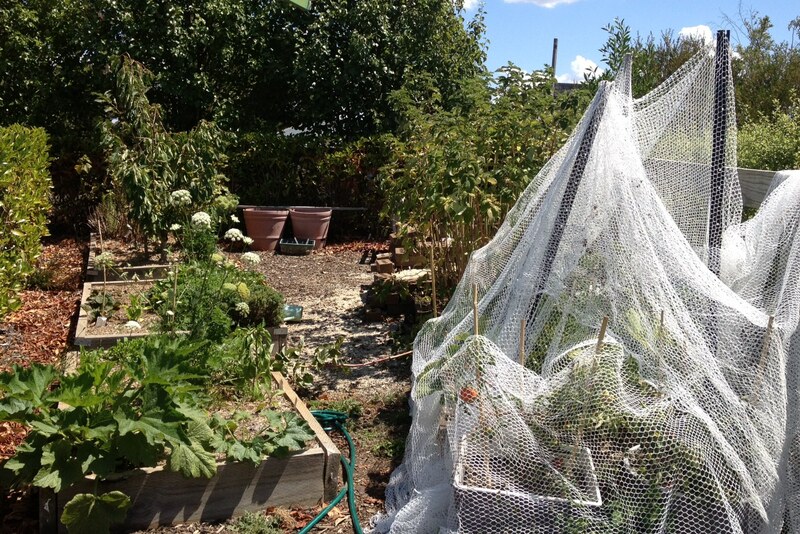 I have heard from a lot of people in the area that they have not had much fruit on their tomato plants this season. My mum’s had a few green ones last week. Last year there were much more and ripening much earlier. My ones are going very well which brings me to the question: WHY? As you can tell from my progress on here, I am no amazing gardener. In fact, from my record, I am a pretty lousy one (what I lack with skill, I do make up for with enthusiasm). Except for tomatoes. 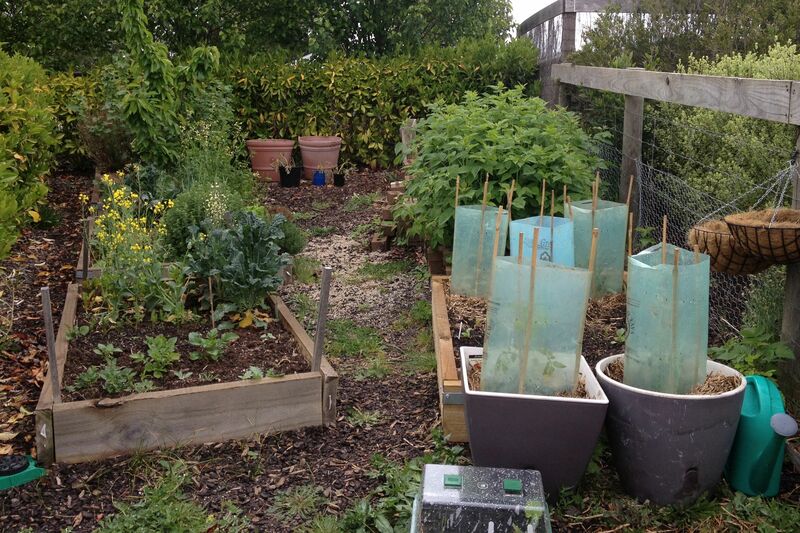 I put it down to the location of my veggie patch. It is extremely sheltered. It is surrounded by one meter high hedges all the way around. One side also has a section of my garden shed. I think this keeps the wind out and maybe creates a warm spot in my garden. 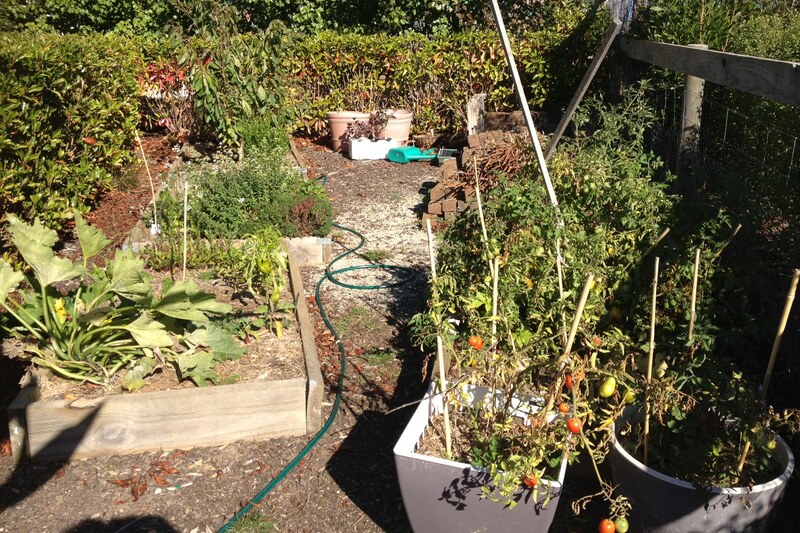 The veggie patch, despite having the hedges all the way around it’s general area, still gets full sun. I also picked my two little pumpkins. I saw a third one developing, but I got the impression from the plant that perhaps it was going to die off soon which doesn’t bode well for it’s productivity. Three pumpkin bushes and three pumpkins? I’m going to cook one tonight to see how good they taste. A couple of little plants have popped up where I planted my seeds. No basil. I read somewhere one upon a time that basil was the easiest thing to grow from seed. What does that say about my skills? At least all the rocket seems to have popped up. I need to thin it out. The weather couldn’t get anymore contrary this week. Wednesday I was sweating it out on my run, thankful that I had done all my gardening in the morning. Ok, so it was a high of about 27 degC here, but coming out of a winter where the nights were below zero that feels like the surface of the sun. Today and yesterday, in contrast, are cold rainy affairs that have my thermostat turning on the heaters! All this adds up to lots of growth in my garden in the coming days, I think. I still need to get rid of the finished crops and think about what I can put in their places. My pumpkin seeds have started popping up. I planted 4 in each mound and so far there are 3 on the right and one of the left. I wish this same success rate could be applied to my capsicum mix! Just when I was thinking about tipping them out and starting over I see this morning that one of them has possibly popped up. Or maybe it is a weed. Either way, I have consulted the oracle (Google) and it seems I can plant the seeds up until the end of November and that they need to be in the seed trays for 5 weeks before going into the garden bed. These capsicums are starting to sound like a long term plan. I used to have Seven Nation Army by The White Stripes as my ringtone for ages. I just remembered that. I have found some lovely, stylistically varied versions on Soundcloud. I really liked the idea of the Salsa one, but it needed a little extra oomph. Like may some marraccas or castanets. This one has soul. He may not always sing in tune, but he has the attitude.